The Telegraph newspaper in the UK describes Vietnam's terraced rice fields as looking like another world. UK daily newspaper The Telegraph has voted Vietnam’s terraced rice fields in sixth position on its Top 25 most surreal landscapes in the world. Joining the terraced rice fields are the world’s largest salt flats, Salar de Uyuni in Bolivia, the world’s third-largest hot springs, Grand Prismatic in the US, the salt and soda lake Natron in Tanzania, Quebrada de Humahuaca Valley in Argentina, the Wave - a sandstone rock formation in Arizona, the Mendenhall Glacier cave in Alaska, Shubazakura Hill in Japan, Dallol volcano in Ethiopia, and Cano Cristales River in Colombia, among others. The terraced rice paddies in Vietnam, The Telegraph wrote, form one of the most striking green landscapes in the world. 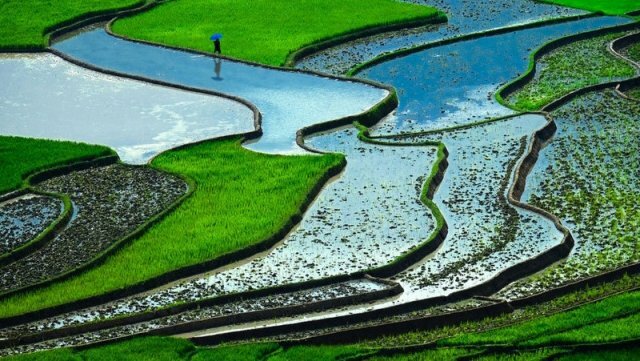 The terraced rice fields have been created by people living in mountainous and hilly terrain, where there is a shortage of flat land for rice cultivation. 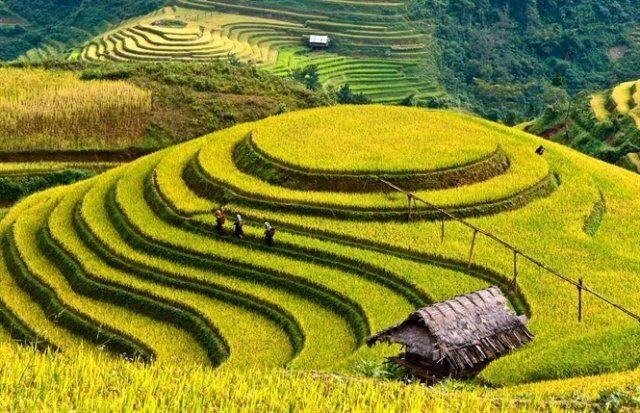 They chose areas with gentle slopes and advantage positions for receiving rainwater and stream water, changing them into spectacular terraced rice fields. This is evidence of the creativity of local ethnic minority people in adapting to the local climate, soil, and irrigation conditions. At any time of year, the terraced rice fields possess a different beauty. In April and May, they are watered to prepare for a new crop and their surfaces look like mirrors reflecting the colors of nature. Under the sunlight, the flooded terraced fields seem to overlap each other, like steps leading up to the sky. In June and July, the terraced fields wear green “dresses” of fully-grown rice. In September and October, when the harvest begins, they change from green to yellow, resembling golden silk scarves flying in the wind above green mountain slopes. Ethnic minority people, in their colorful costumes, embellish the beautiful picture. Terraced rice fields are most commonly found in Sapa (Lao Cai province), Mu Cang Chai district (Yen Bai province), Hoang Su Phi district (Ha Giang province), Que Phong district (Nghe An province), Pu Luong district (Thanh Hoa province), and the central highlands region. The imposing scenery, along with the unique features of local ethic minority people’s culture, attract both domestic and foreign tourists and inspire photographers.